Sometimes you just don’t have the time of the energy to make dinner but you still want something tasty. It is at times like these that I like a quick pasta such as a carbonara pasta. The carbonara sauce comes together easily and in less time than it takes to boil the pasta. A typical carbonara sauce consists of egg yolks, parmigiano reggiano, pancetta and black pepper. One of the reasons that I like carbonara is that you can play around with it by adding different things. Shrimp is one of my favorite foods and I had been wanting to try a shrimp carbonara for a while. The shrimp carbonara did not disappoint; It was nice and light and tasty and the succulent shrimp worked well in the carbonara pasta. It was a super quick dish that did not compromise in flavour. Fry the bacon in a pan and set aside. Drain most of the bacon grease from the pan but reserving about 1 tablespoons worth. Add the shrimp, garlic and pepper and saute until just cooked. Mix the egg yolk, heavy cream and parmigiano reggiano in a bowl. I love that this did not take you any “energy” or “time.” It looks absolutely amazing!! And the shrimp look nice and huge! I love the shrimp in this dish! So succulent! Now that is my kind of dish! Thanks for sharing with Presto Pasta Night. Dang that looks good, I have been off shrimp for awhile, but I am willing to try for that! OMG, Kevin, my son just asking me (5 minutes ago) weather I have shrimps, he really in the mood to make pasta. I regret that I don’t have any. Not even a frozen one. I guess I just have to ask him to stare at your dish instead! Yay! This is my kind of carbonara! I’ve never made carbonara. I am going to bookmark this for it’s ease and how quick it is to make. That looks so good! I like quick and easy. Especially after a long day at work. I will have bookmark this for one of those days. That looks amazing! I love the noodles you used. What a yummy food kevin..
that shrimp looks like it is perfectly cooked! and it sounds delicious! i like anything that has “carbonara” in the name!! Looks delicious, Kevin. Quick cooking shrimp is a great way to make this carbonara even more no-fuss! I love recipes that are made with things that are always in the pantry. I keep good quality shrimp in the freezer (because we don’t get fresh shrimp here), and the rest is easy. So simple yet so incredible.. Thanks in advance for saving me so much cooking time!! ooh this looks so good! a nice twist on the traditional carbonara. will have to try this the next time i have pasta. This dish looks just too good ;-P! Pasta and shrimps = paradize! Now that is one lovely looking carbonara! I want some right now and its only breakfast time!! I love shrimp and pasta. I am making this recipe very soon. I love that it is so simple yet looks so tasty. Thanks for the recipe…. This you call easyto make. Wow i would be in the kitchen longer then you to make them. I love this, will have to make them. Those bacon pieces must have given a realy super taste to the scampis. Seems like we were both in the mood for shrimp! I’ve been meaning to make pasta carbonara at home for a while.. yours looks great! How do you manage to cook something new all the time? 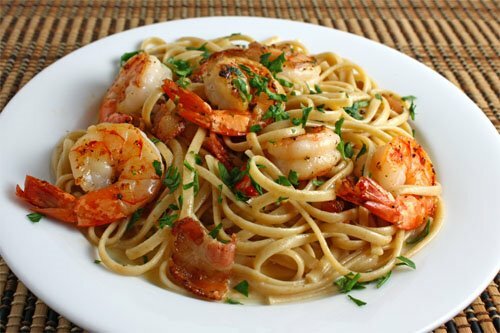 Love shrimp and pasta, what a nice recipe. Beautiful Dish! I seriously want to grab a fork and dive into that bowl! Nice! I love pancetta in anything. I’ll have to put this on my growing list of things to make! I keep seeing carbonara recipes… will have to make it soon as it just sounds amazing. Beautiful – as always! this sounds like a great twist on pasta carbonara…one of my faves for comfort. Oh goodness, we had the same meal las night. I just had to use bacon…no shrimp this time of the month!Looks delicious though! I love this, it looks so fresh. Makes me wish spring was sooner! I may not have the energy, but oh, do I have the inclination to make this dish! Looks great Kevin. Great idea when you need something on the simpler side or the energy. I love how huge the shrimp look (an oxymoron I guess!) Your quickie dinners are so much better than any fast food any day! looks delicious! i love shrimp in pasta! YUM! Thanks for sharing the recipe. I never knew how easy it was to make at home! All I can say is, nom nom nom. This looks terrific! I love shrimp any way I can get it! I just found your blog and wow…I’m amazed. Just amazed! You went from a person who ate the same thing often to someone who cooks, photographs and writes about such a beautiful variety of seasonal meals it’s just so impressive. I can’t wait to try your recipes and thanks for the wonderful blog! This looks amazing. I love carbonara with chicken. I have never tried it with shrimp but it sounds soo good. Kevin, I am definitely tagging this one! It looks perfect, I can’t wait to try it. I am such a big fan of yours 🙂 Please don’t ever stop blogging! Oh and I’m linking to this. Once again, I bookmarked this from the title alone. Oh…and that gorgeous picture! Kevin, the picture is wonderful — I can almost taste the shrimp! Oooh, I’ve never had shrimp in a carbonara before, but it sounds wonderful! Bacon? Shrimp? I’m so there! i have made this twice and i love it! i love your blog and have nearly 50 of your recipes bookmarked! Your picture looks great, but I can’t eat no Carbonara with bacon. It just isn’t right. This was wonderful! We wanted something quick and this was exactly that, and it tasted great. I am so glad I found your blog. I will be making the zucchini and blueberry bread this weekend. So glad you shared this on your Facebook feed! Looks and sounds amazing. Shrimp are plentiful and cheap here now at the end of the season, cheaper than chicken! So, I'm always looking for new ways to incorporate them into our meals. Can't wait to try this one! This recipe looks great for a Father's Day dinner meal! I'm going to be serving four people. How many servings can this recipe make? Thanks! Anonymous: This recipe makes 1 serving but easily doubles or quadruples! Oh, I'm so hungry now. Have not taken my meal. This looks so slurpible, so smooth.